The Ibanez 2018 RGIX6FDLB Iron Label Electric Guitar in Northern Lights Burst is ideal for guitarists who prefer to walk on the heavier side, and favour a fixed bridge instead of a tremolo. From the woods selected to the tiniest of appointments, the RGIX6FDLB is an awesome model that is begging for your attention. The Iron Label series is the go-to for players who like to lay down hard hitting riffs in brutal sonic assaults without restraint. Shaped to the RG body profile, the RGIX6FDLB is delightfully comfortable to perform with, featuring a slender body depth that is combined with deep double-cutaways, bevelled edges, and a lightweight feel. In short, this guitar allows you to jump and move to your heart's content. The Ibanez 2018 RGIX6FDLB is equipped with a pair of DiMarzio Fusion Edge humbuckers, which are designed to deliver the full sonic potential of the Iron Label guitar. Producing an aggressive yet focused output, the Fusion Edge pickups are brilliant for those who have a highly dynamic playing style. If you're one for hammering staccato chops that include chunky palm-muted riffs with two-handed tapping over the top, then these little dynamos are everything that you could have hoped for - and more. 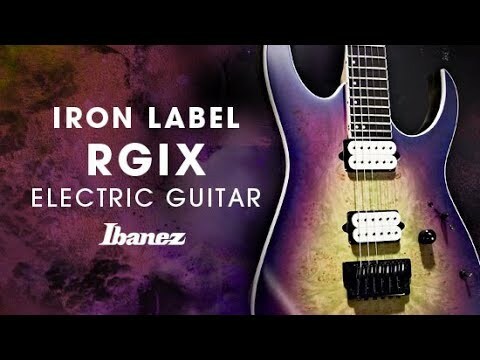 The Ibanez 2018 RGIX6FDLB Iron Label Electric Guitar is equipped with a Gibraltar Standard II bridge, which anchors each string securely to optimise intonation and sustain. The headstock is home to Gotoh MG-T locking machines heads, which work tirelessly to uphold tuning integrity with absolute precision, getting you through every gig in style.